The resumption date for the commencement of academic activities for the 2018/2019 academic session at the Federal University Ndufu Alike, Ikwo (FUNAI) has been announced. 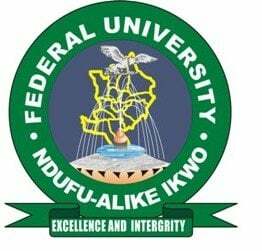 Following the suspension of ASUU strike, the management of the Alex Ekwueme Federal Univesity, Ndufu-Alike Ikwo (AE-FUNAI) announced the date for the commencement of academic activities for the 2018/2019 academic session. See also: FUNAI Academic Calendar for 2018/2019 Academic Session.